"This is indeed the castle of evil....White House." Elk and Arc as allies? Indeed, this is how volume 4 of Arc The Lad begins, with a surprising new friendship forming between formerly bitter enemies. Now that most of the Prodias government's secrets are all out in the open, our heroes must react. Something must be done to stop White House, the facility that experiments on children, as well as the Nameless Crusade—the sinister White House agents posing as spiritual saviours. Mayor Galuano, obsessed with creating Chimera warriors (bizarre mutants), has left Arc and his rebels with no choice but direct conflict. Episodes 12 and 13 mark an important, if not epic, turn of events for the series. Elk and his friends assault White House only to discover the horrible secret behind the false 'god', the Holy Mother. As they attempt to rescue what children they can, major changes are in store. Everything changes here, mainly the focus of the plot, which is no longer concerned merely with Prodias and White House, but with much bigger problems facing the world as a whole. The elemental spirits that protect humanity are now in danger and Arc reveals himself not as a terrorist, but as the one chosen by the spirits to defend mankind. After a deeply disturbing, emotional conclusion that I doubt anyone will easily forget, episode 13 paves the way for this direction. Now, the threat for Arc and Elk comes from the nation of Smeria, where Arc is originally from. Clive, the scheming genius behind the Chimera project, has now come up with far more elaborate plans to complete his vision, and part of it relies on the capture of Lieza, so that her spiritual powers can be harnessed. To make matters worse, Smeria hides the legendary "Ark", which contains vast, supernatural power. The only source of peace any of our heroes can possibly find is that they live, for now, in an ancient sanctuary that cannot be penetrated by evil. Elk has gone far beyond his simple "adventuring boy on the run" origins, and is now part of a much larger attempt to free the world of the oppression that its rulers want to impose on it. Arc The Lad is pretty much reborn here. Since so much of the focus changes, it's like a whole new show. Elk is no longer the "star" character, as it were, as the cast has suddenly doubled. While I can't be certain, I'm assuming that the transition here was actually a new season on television in Japan; in a way, it becomes a different experience. The emotional complexity increases, as does the political intrigue. Arc handles it well, though, and rather than collapsing under the weight of such sudden shifts, it bears up and becomes stronger. 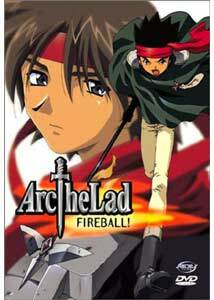 I recommend Arc The Lad more than ever, and I'm itching to play the video games now. Image Transfer Review: Another stellar, cel-like transfer from ADV. No real complaints here; the animation looks solid and perfect. It would appear that ADV has made these new 5 episode volumes as dual-layer discs. Audio Transfer Review: The Dolby 2.0 soundtrack doesn't use the surrounds, but it does heavily use the front 3 channels for a very complete, rich sound. Pretty much the entire show uses stereo effects for almost every element except dialogue, which is mostly center channel-oriented. It's a satisfying track that feels properly "epic" to fit the mood of the show, especially when turned up at loud volumes. Extras Review: Trailers (Nadia, Getter Robo, Orphen) are the only significant add-ons. The subtitle/language track has a slightly different set-up here to make provisions for the fact that after episode 13, the end credits completely change with a new song. As a result, you can also choose English audio with subtitles just for the ending theme. The dub is acceptable, and remains faithful to the script, but the Japanese audio is certainly more expressive. Just the fourth entry in the series, and I already feel like I've watched dozens of discs: such is the elaborate and heroic quality of Arc. Game translation gurus, Working Designs, still claim a late 2001 release for the Arc The Lad Collection designed for the PSOne (original Sony PlayStation), but I get the feeling it may very well slip into first quarter 2002. The anime, however, makes a great preparation kit for the games, so while we're waiting, we're not completely left without options.